Are you looking to create a blog? We know the thought of launching a blog can be scary, especially if you’re not a tech-savvy person. But, the good news is: starting a blog is way easier than you think, regardless of your skill set. Blogging platforms like WordPress make it super simple for anyone to start a blog without knowing a single line of code. Once you’ve set up the blog, you can create content in a post editor that looks very similar to Microsoft Word. You can customize the design, look, and feel of your blog with an easy-to-use drag and drop interface. In other words, starting a blog in 2019 is A LOT easier than starting one 10 years ago. So, you want to make a blog… but why listen to us? Unlike other wannabe experts and false prophets, we only preach what we practice. We’ve built several large blogs in our career including this one. Having helped thousands of WordPress users get started with blogging, we know exactly what it takes to build a stunning blog from the ground up. Whether you’re an absolute beginner or just in need of a refresher, in this guide, you’ll find everything you need to get your blog up and running. Chapter 1: Why Start a Blog? 2.2. Why Do We Recommend WordPress.org? In this step-by-step guide, we’ll walk you through how to start a blog from the ground up in less than an hour. If you’d rather cut straight to the chase and dive into the step-by-step technical tutorial, then go for it. Blogging has come a long way since its inception. Initially, it was used by individuals for sharing their personal thoughts and opinions. Now even businesses around the globe leverage blogs for expanding their reach and to generate new leads. When it comes to blogging, having a purpose is critical, or you’ll lose the direction and inspiration as time passes. When you blog with a purpose, your readers will connect with it because that purpose shines through in your writing. Some people blog to document everything they have going on, so they can keep track of their progress. It helps you connect with like-minded people in the community and build long-lasting relationships with them. A lot of people start a blog with a single goal: to make money online. Advertising: Sell ad space on your blog and generate a steady stream of income from it. Affiliate marketing: Refer products to your audience and generate revenue when they purchase using your referral links. Sell products: Create a product that you know your audience will love and sell it on your blog. In this crowded digital era, blogging can help you demonstrate your expertise and establish you as an authority. In order to do this, you’ll have to keep an eye on trends in your niche and consistently blog about it. Be sure to offer tips and recommendations to your audience on a regular basis so they’ll realize your blog is a go-to resource when it comes to everything related to your niche. When starting a blog, it’s imperative to realize that blogging isn’t always going to be rainbows and unicorns. Blogging is a marathon, not a sprint. Passion: For persistent blogging, you’ll need to choose a topic that you’re really passionate about. You can’t continuously write about a topic that doesn’t excite you. Traffic volume: Just because you love a topic doesn’t always mean it’s the best one for starting a blog. If no one else wants to read a blog on the topic you’re about to choose, then you’ll need to reconsider the topic before jumping in. Purpose: Consider the purpose of your blog when you decide on a topic. For instance, if you want to make a living from advertising, but the niche is too narrow with low traffic volume, then you might want to expand your niche or change your monetization strategy. Blogging is a bit different from conventional writing. If you’re an aspiring blogger, then you might have to unlearn a few things that you were taught in your English classes. For example, when you’re blogging or writing for the web, it’s advised to craft short sentences and even shorter paragraphs, so readers can quickly consume your article. This is mainly because people have shorter attention spans on the web. Another difference is that print editors often recommend writers write in third person. However, bloggers are expected to write in a first person voice. By writing in a first person voice, you’re talking directly to your readers just like you would with your friends. Aside from talking to your readers directly, you’ll also have to optimize your blog posts for search engines. This’ll help search engines discover and index your website, so you can attract more search engine traffic, also known as organic traffic, to your blog. The blogging platform you choose can make or break your blog. Your blogging purpose: When choosing a platform, it’s essential for you to check if it aligns with your blogging goals. Usability: Obviously, you’ll need to choose a platform that’s easy to use. With an intuitive platform, you can easily get things done with minimal learning curve. Monetization: Double-check if your blogging platform of choice allows you to monetize your blog with ads. For instance, some platforms, like the free WordPress.com, don’t allow you to monetize your blog. That means such a platform isn’t a good fit for you if your goal is to make money blogging. Now that you know what factors you’ll need to consider, let’s take a look at different blogging platforms in existence. Without a doubt, WordPress is the most popular blogging platform out there. Originally, WordPress was started as a blogging platform, but it’s now transformed into a full-fledged content management system. With WordPress, you can build any kind of website you can imagine, such as an eCommerce store, forum, niche social network, etc. 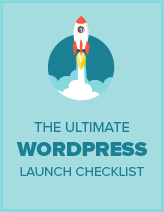 We highly recommend you start with WordPress because it gives you full control over your blog. Pricing: To build a blog, you’ll need to purchase a domain name and web hosting account. A domain name costs around $14.99 per year and web hosting costs around $7.99 per month. 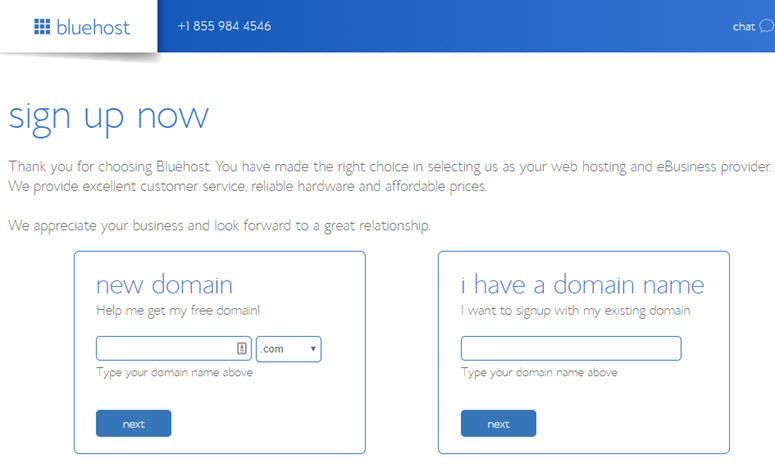 We’ve worked out a deal with Bluehost for IsItWP users, so you only have to pay $2.65 per month. That means 60% off on WordPress hosting and a free domain name. Wix is a free website building platform that also allows you to create a brand new blog from the ground up. 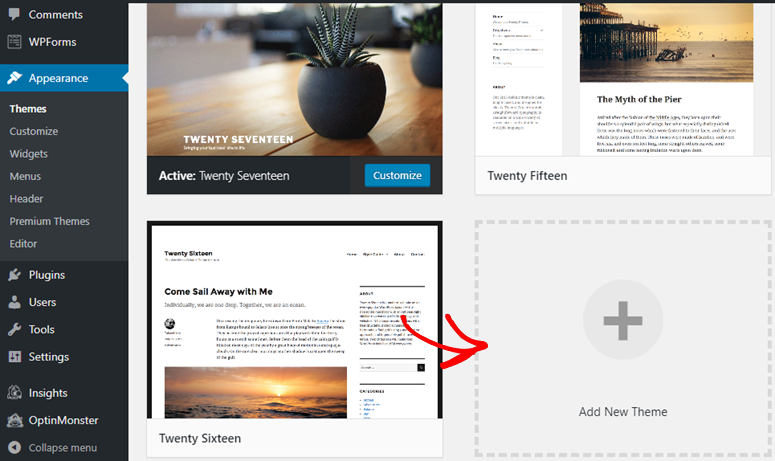 To create a blog with Wix, you’ll need to integrate the Blog app into your Wix website. 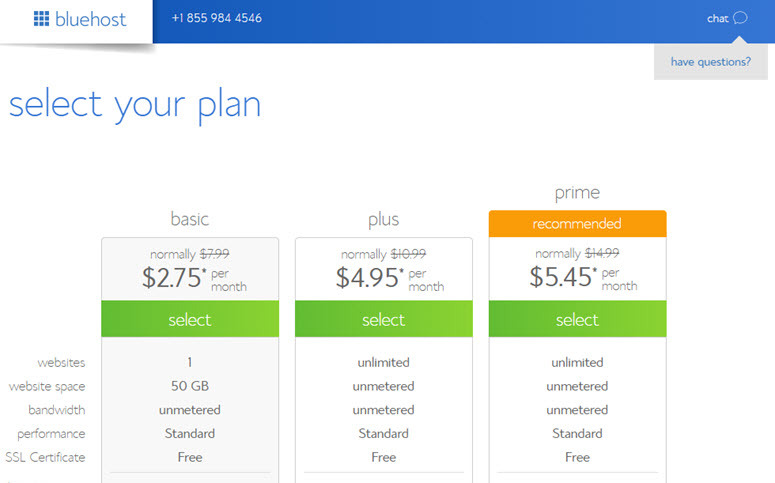 The free Wix plan lets you use 500 MB storage and 1 GB bandwidth. To remove Wix branding and enhance the built-in features, you can purchase a premium plan, starting at $17 per month. WordPress.com is a free blogging platform managed by the same folks as WordPress.org. With WordPress.com, you can create a free blog, without purchasing a domain name. You can upgrade your subscription for enhanced features, such as a custom domain, monetization, additional storage, etc. Make sure to check out the differences between WordPress.com and WordPress.org. Pricing: You can start a basic blog for free. For $48 per year, you can connect a custom domain name and remove WordPress.com ads. To monetize your blog, you’ll have to get the Premium plan for $96 per year. Blogger is a free blogging platform by Google. Blogger allows you to start a blog and monetize it with ads without having you to spend a dime. While it comes with all the features you’ll need to run a blog, you can’t add enhanced functionalities like an eCommerce storefront. Pricing: Blogger is a 100% free blogging platform. We recommend using the self-hosted WordPress.org platform to everyone because it’s a truly superior blogging platform. We use it on all of our websites, including this one! The main difference between self-hosted WordPress and other options is that it gives you full freedom and control over your site. You can customize the look and feel as needed. You can monetize your website however you like. You can even add an online store to your blog. Last but not least, nobody can delete your blog just because you didn’t follow their terms of service. See this guide to see the full list of differences between WordPress.com vs WordPress.org. Now that we’ve chosen the platform, let’s take a look at what do you need to start a WordPress blog. « Previous: Chapter 1 – Why Start a Blog? Starting a blog isn’t rocket science. With the right set of tools, it’s easy to get your blog up and running. No matter what kind of blog you’re looking to create, you’ll need to have a few things in hand, such as a domain name, a blogging platform and web hosting. After setting up the blog, you’ll need to customize its appearance, add essential functionalities, and more. Registering a domain name is easy and cheap, but it’s important to choose the right domain name for your website that’s easy to type and remember. Your domain name is your blog’s address on the internet, like Google.com or IsItWP.com. It’s what your customers type in their browsers to access your website. A domain name normally costs around $14.99 per year. Let’s take a look at a few different approaches you can follow to choose a domain name for your blog. Gone are the days when you can boost your blog’s search rankings with a keyword stuffed domain name. While including a keyword in your domain name can still have a positive impact, stuffing with keywords could negatively impact your SEO efforts. When choosing a domain name, it’s advised to go for brandable domain name, like ProBlogger.com or OptinMonster.com over keyword-stuffed one, such as copywritingtweaks.com or killercopywriting.com. Not only are they easier to remember, but it helps you get positive SEO impact in the long run. .com domains are so popular that people are more likely to type in [yourblog].com on their browser to visit your site. In fact, if you choose a different extension, then you might want to do extra work to get people to remember it. Of course, we always recommend choosing a .com domain name for your blog. However, if .com isn’t available, you can go for .net or .org. Choosing a perfect domain name for your blog can be intimidating because it’s highly likely that your first domain name of choice’s already taken. That means you’ll need to brainstorm domain name ideas and check for its availability one-by one. A domain name generator helps you save time by automatically generating tons of domain name ideas by simply entering one or two keywords. You can choose IsItWP’s domain name generator for finding the perfect domain name. Now that you’ve found a domain name, the next thing you’ll need to do is register it and set up web hosting. If you’re new to the web space, below is the definition of a domain name and web hosting. Domain name: Your domain name is your blog’s address on the internet, like Google.com or IsItWP.com. It’s what your customers type in their browsers to access your website. A domain name normally costs around $14.99 per year, but we’ll show you how to get one for free later in this article. Web hosting: Your web hosting account is where your blog’s content and files are stored. Think of it as your website’s house. When a visitor tries to access your blog by typing your web address (domain name), they’ll be directed to the website files stored in your web hosting server. Web hosting typically costs $7.99 per month. When you’re first starting your blog, the combined cost of a domain name and hosting can seem like quite a lot. That’s why we’ve worked out a deal with Bluehost to offer our users a free domain name, free SSL, and over 60% off on WordPress hosting. Bluehost is one of the largest hosting companies in the world. They’ve been involved in the WordPress community since 2005, and they’re an officially recommended hosting provider by WordPress.org. Note: We believe in full transparency. If you purchase hosting using our referral link, then we will get a small commission at no additional cost to you. You’ll actually get a discount on hosting + a free domain + free SSL. We can get a commission from just about any hosting company, but we only recommend products that we truly believe will give value to our readers. To start your WordPress blog, head over to Bluehost’s website and click the Get Started Now button. On the next page, you’ll be asked to choose a plan. Since you’re just getting started, you can choose the basic plan that also includes a free domain and free SSL certificfree SSL certificate. You can always upgrade your account as your site grows. You can now either choose an existing domain you have or purchase a new domain for free. We recommend getting a new domain since it’s free. You’ll now be prompted to enter your account information. 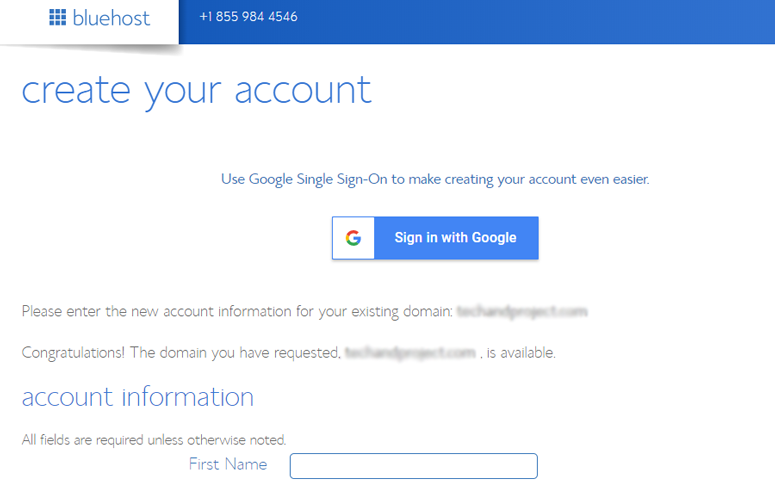 For easy registration, you can sign in with Google with just a couple of clicks. After entering your details, scroll down the page until you find the package information box. You can select the basic plan for 12 months, 24 months, or 36 months. You’ll also see that a few addons are preselected which increases the total price. You can uncheck these addons because you won’t be needing them right away. You can always add them later, if needed. Note: Choosing the 36 months plan will get you the best value for your money! Once you have configured your plan, scroll down the page further to enter your payment details. You’ll need to Agree to their Terms of Service and then, click Submit. You’ve successfully subscribed to a hosting plan. You’ll be asked to create a password for your account. After that, you’ll receive an email with details on how to log into your web hosting control panel (cPanel) where you can manage everything from hosting files to emails and support. With Bluehost, you don’t have to go through a separate WordPress installation process because Bluehost now does it by default. All you have to do is choose your WordPress theme, then specify the name and tagline for your blog, and you’ll be ready to get started with WordPress. 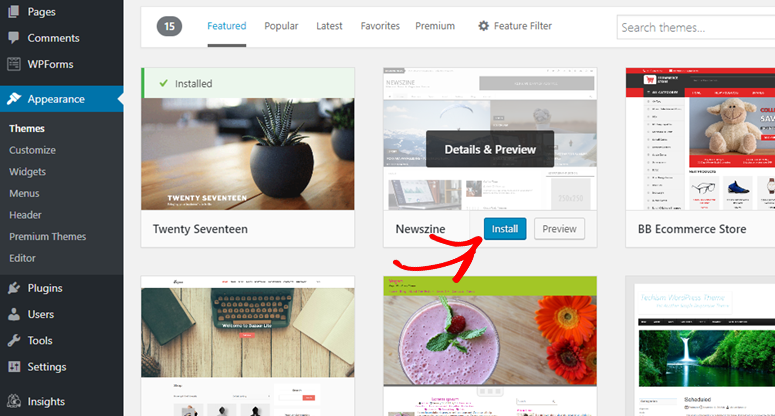 After subscribing to your hosting plan, you’ll now be prompted to choose a WordPress theme. You can pick just about anything during this step because you can always change your theme later (we’ll show you how to do this in a later step of this tutorial). The most important part is to start building your blog, so go ahead and choose any theme that catches your eye just to get you rolling. You’ll then be asked to choose the name and tagline for your blog. 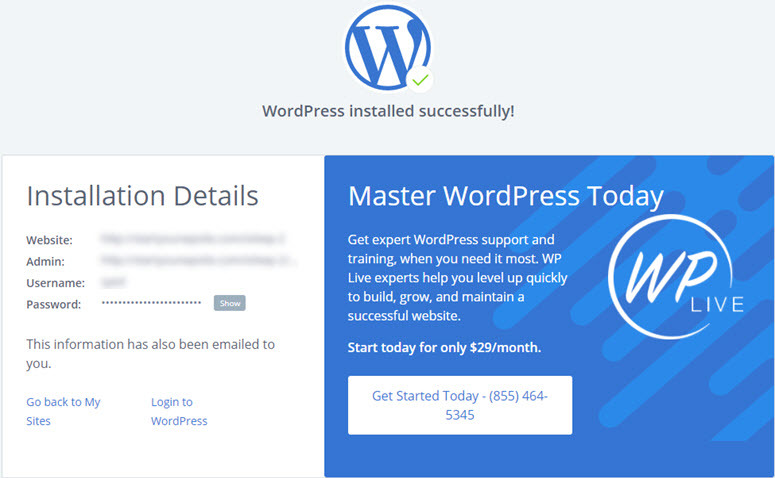 You can now log into your WordPress blog with the credentials sent to your email address. 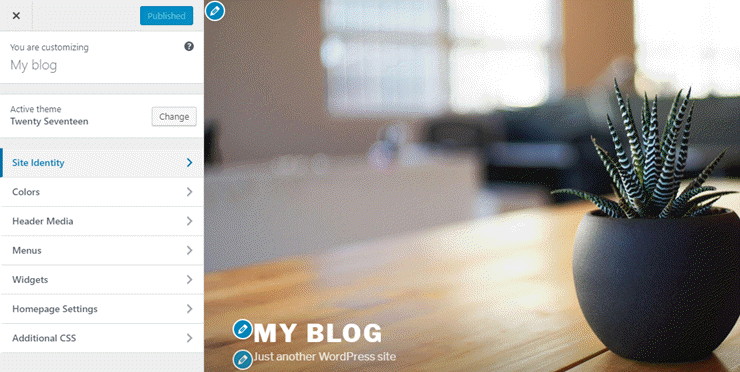 Now that you’ve logged into WordPress, changing the visual appearance of your blog is easy. All you have to do is find the right WordPress theme and install it on your WordPress blog. The default WordPress theme is good, but if you want a different look and feel for your site, then you can find an alternative theme from the official theme directory and install it on your site. But before you choose a random free theme for your blog, take a look at our list of top WordPress themes and decide which one would be the best choice. If you choose a premium theme, then it has to be downloaded from the theme vendor’s site and uploaded to your WordPress. If you decide to go with a free WordPress theme from the official theme repository, then you can search and install it directly from your WordPress dashboard without having to download it to your computer. To install a free theme, navigate to Appearance » Themes in your WordPress dashboard. Then click the Add New Theme box. You will see some featured themes in your dashboard. Before installing a theme, you can preview it by clicking on the thumbnails displayed. 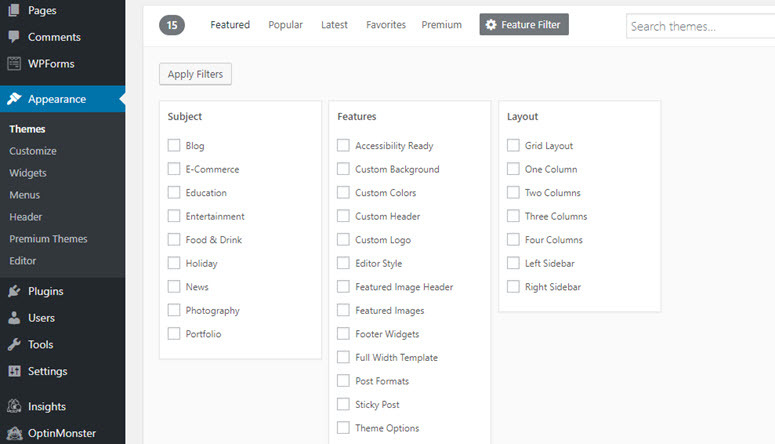 You can also filter themes based on layouts, features, and blog niches by clicking on the Feature Filter button. In the right-hand corner, type the theme name in the search bar. Once you’ve found the right theme, hover on its image and then click the Install button. Next, you need to click Activate to change your blog’s appearance. Now that you’ve installed a WordPress theme, you probably want to know how to enhance your blog by adding features like a contact form, photo gallery, etc. With WordPress, you can find thousands of free plugins (apps) that let you easily add additional features to your blog without having to touch a single line of code. Just like WordPress themes, you can easily find and install free plugins from the WordPress plugin repository within your WordPress dashboard. All you have to do is to visit the Plugins » Add New page and use the search box in the right-hand corner to find a plugin. Once you find the plugin you’re looking for, click the Install Now button and then click Activate. By now, you’ve had your basic blog setup. You already know how to change a WordPress theme and install plugins. So far so good. In WordPress, permalink is the web address / URL of the content you publish on your site. It’s what people enter into their browser address bar to visit the web pages of your site. The wrong permalink choice can hurt your search engine traffic and referral traffic, so it’s essential for you to choose the right one when setting up your site. The default permalink structure known as Plain contains some random numbers in your URL, which tells nothing about your content, so pretty much any other choice is better. Pick the one that best suits your needs. 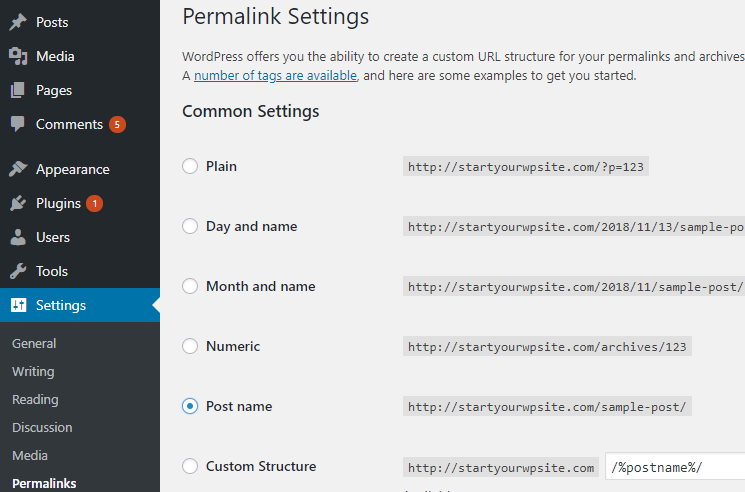 To choose the right permalink structure, go to Settings » Permalinks in your WordPress dashboard. If you don’t have any preference, you can simply choose the Post name option from the list. WordPress comes with an option that allows you to easily discourage search engines from indexing your site with a single click. Not to mention, you should never check this option if you’re running a publicized website or blog. However, below are a few use-cases when you want to consider discourage search engines from indexing your site. Private content: You may not want to index your private content behind a paywall like a membership site, which is created specifically to your members. Test / development / demo site: To avoid duplicate content penalty for your production site, you might want to de-index your development site from search engine. Dynamic content: Similarly, you might want to discourage search engine from indexing your site if you create dynamic content that updates too frequently. Want to instantly update your theme settings while previewing your site’s appearance? 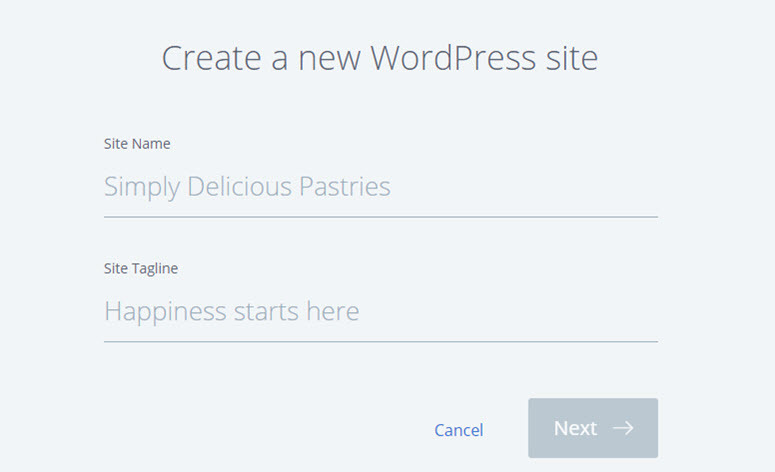 It’s now possible with WordPress Customizer. WordPress Customizer lets you preview what your site content would look like with a different theme, with different theme settings, and more. For example, you can set your Site Title, Tagline, and Favicon easily. To change the settings, all you have to do is navigate to Appearance » Customize. Navigation menu provides a quick link to some of the most important pages of your site. 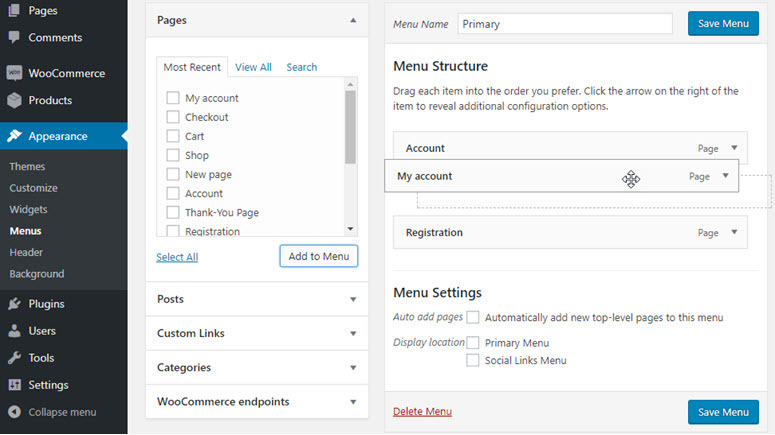 In WordPress, navigation menu is a theme feature. Its appearance and display are controlled by your WordPress theme. Once you have some important pages created, you can go ahead and set up a navigation menu. To add, edit or manage your navigation menu, go to Appearance » Menus. Then, click create a new menu. You’ll now be prompted to specify Menu Name. As you can see in the screenshot, our theme supports 2 different menu locations: Top Menu and Social Links Menu. Keep in mind that menu locations and their names vary from theme to theme. 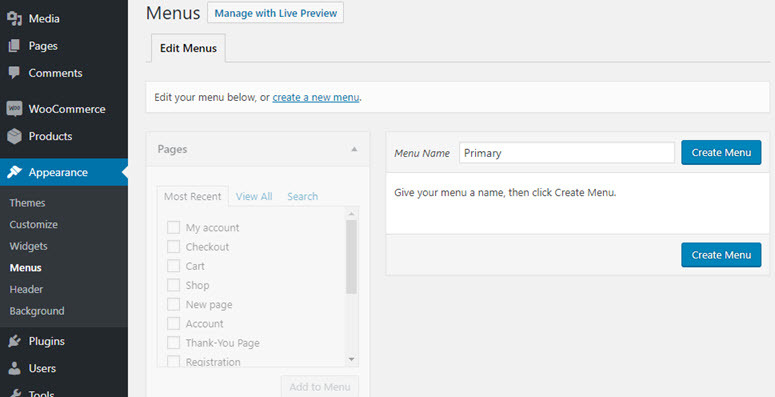 Next, select the pages that you want to add to the menu and then, click Add to Menu. You can reposition the menu with drag and drop. You can then choose the menu location and click the Save Menu button. WordPress widgets are simple movable elements that let you easily customize your website. You can use widgets to do a variety of things, such as displaying recent posts, popular comments, email signup box, etc. You can add widgets to your widget-ready areas of your website. Usually, this means your blog’s sidebar, but many themes support adding widgets to footer as well as other sections in the homepage. To add widgets to your widget-ready areas, such as sidebar and footer, follow the below steps. In the left-hand panel, you can find a list of available widgets. You can find a few different boxes on the right-hand side, which are widget-ready areas supported by your theme. In our example, our widget supports 3 different widget-ready areas: sidebar, footer 1, and footer 2. To add a widget, all you have to do is drag it to any widget-ready area. Comments are the lifeblood of any blog or online publication. Blogs are not monologues. They’re built for having 2-way conversation with your readers through comments. With blog comments, you can encourage your readers to engage with you and other readers. But you always need to moderate your comments before it go live. That way you can ensure only legitimate comments get published. By default, WordPress allows users to comment on your blog. If you don’t want to accept comments, you can go to Settings » Discussion, and then uncheck the box next to Allow people to post comments on new articles. Just like comments, by default, WordPress allows pingbacks and trackbacks. Pingbacks and trackbacks allow other blogs to notify you whenever they link to you. Since most pingbacks and trackbacks are spam, it’s in your best interest to disable them on your site. To do this, you can uncheck the box, Allow link notifications from other blogs by going to Settings » Discussions. The default WordPress time zone is UTC +0. After installing WordPress on your site, you might want to change the time zone to your preference. This makes it easy for you to schedule your posts in advance. To change the time zone, go to Settings » General and then, either choose a City or a UTC timezone offset. Having the right set of plugins in your toolbox is necessary to expand the core features of your WordPress blog. Every blog is unique in terms of audience, content, design, and features. However, there are some common plugins that almost every blog will have to install. Since it’s quite easy to get overwhelmed with all the different plugins available for WordPress that do almost the same thing, we’ve handpicked the best ones below. We use these plugins on our own sites and recommend our users install them as well. For your convenience, along with the plugins’ name, we’ve also explained their use and provided links to the pro and free versions. Since a detailed explanation about ALL the plugins would be overwhelming, we’ll explain how to add just 3 of the most essential features to your blog using the plugins listed above. Regardless of your blog’s topic, including a contact form on your blog is necessary. Adding a contact form to your blog makes it easy for your visitors to contact you. 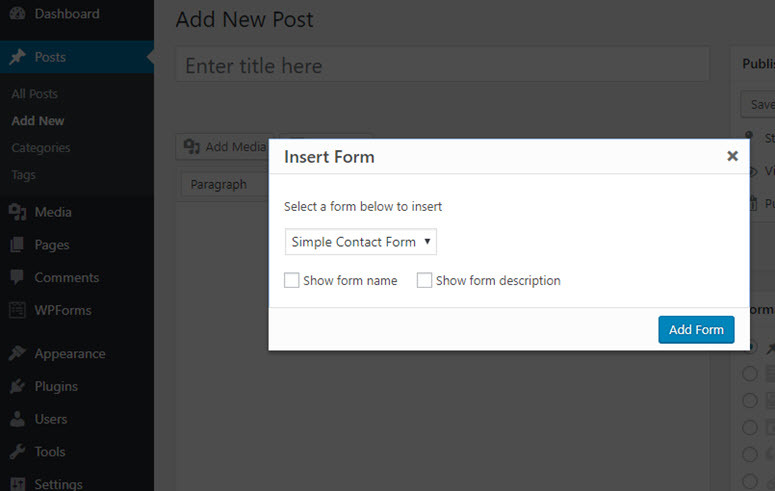 WPForms is the best contact forms plugin for WordPress beginners. It lets you create a contact form with a drag and drop builder and allows you to publish it anywhere on your site with ease. All forms you create with WPForms will be 100% responsive meaning it works on mobile, tablets, and desktops. Seamlessly integrate your form with your favorite email marketing tools or third-party web apps. To create a form on your blog, first off, you’ll have to install WPForms by navigating to Plugins » Add New. Search for the WPForms plugin and, when it shows up, click Install Now, and then Activate. You’ll then be directed to the beautiful welcome page of WPForms. 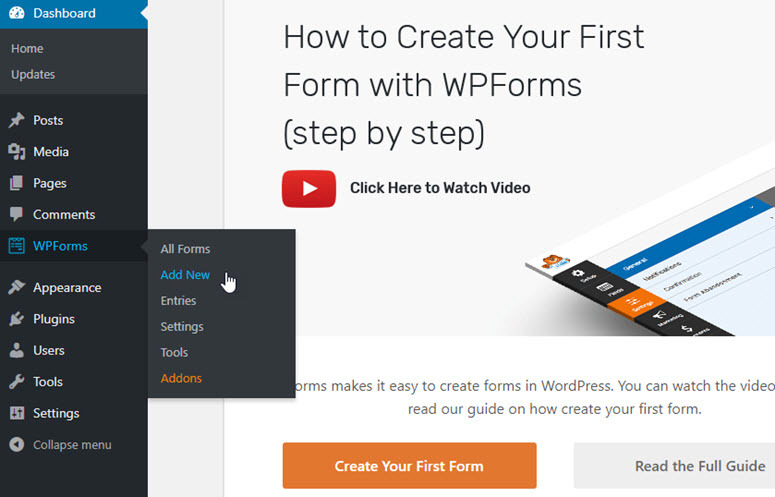 You can either click the Create Your First Form button or click WPForms » Add New to create your first form. Next, you’ll be prompted to choose a template. You can select one of the premade templates or start with a blank form. If you want, you can give a custom name to your first contact form. WPForms makes it easy to build a form with drag and drop. Click on the appropriate form fields in the left panel to add them to your form. You can also easily re-arrange them and even remove any unnecessary fields with ease. After making the necessary changes, click Save. Next, go to your post or page editor and click the Add Form button above the text editor. You will need to select the right form you want to publish and then click Add Form and then click Publish. That’s it! You’ve successfully published a contact form. 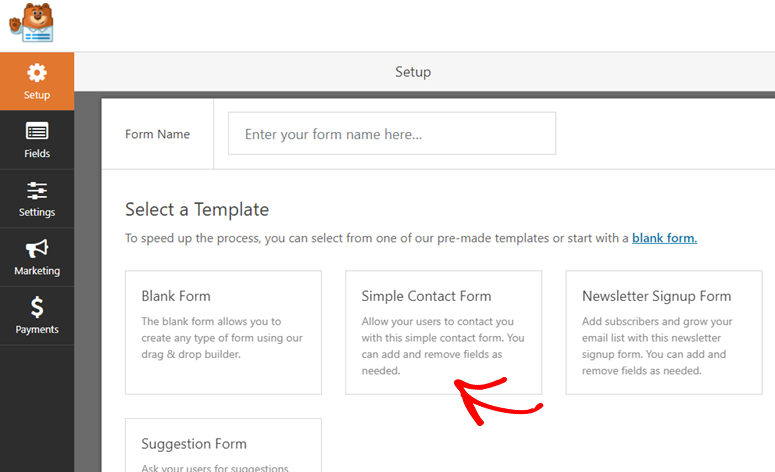 Want to create a contact form the easy way? Then, get started with WPForms today. Want to start with the free version instead? Try WPForms Lite. If you want to grow your blog traffic, then you need to understand how people are finding your blog and what they do once they’re on your blog. The easiest way to track user interaction on your site is using Google Analytics. Google Analytics is the best tracking solution for websites, and it’s free to use. 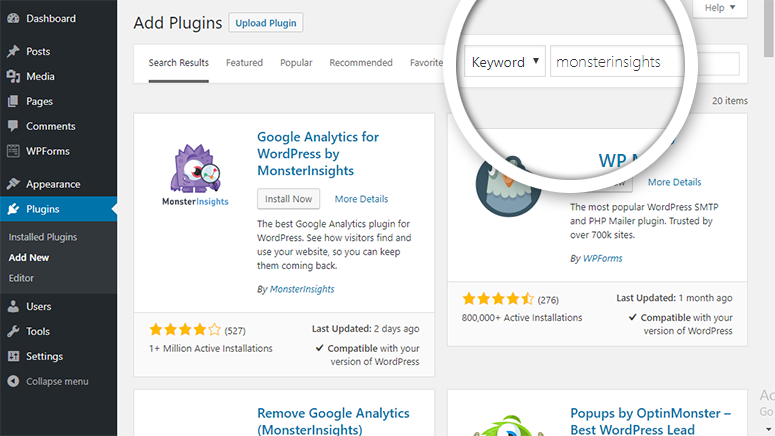 The MonsterInsights plugin makes it easy for you to set up Google Analytics on your WordPress blog. Plus, it allows you to make use of the full potential of Google Analytics tracking, like file downloads tracking, ads tracking, form submissions tracking, eCommerce transactions tracking, etc. without having to touch a single line of code. To set up Google Analytics on your blog, head over to Plugins » Add New. 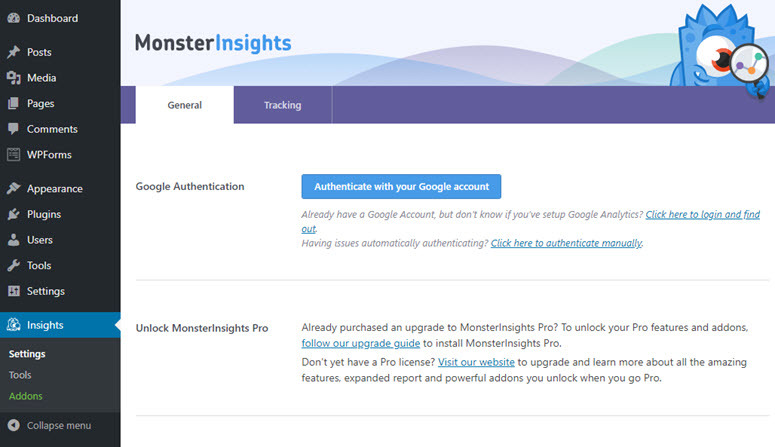 Search for MonsterInsights and, when the plugin shows up, click Install Now and then, activate. Head over to Insights » Settings to authenticate your blog with Google Analytics. Click Authenticate with your Google account. On the next screen, select your Google account. 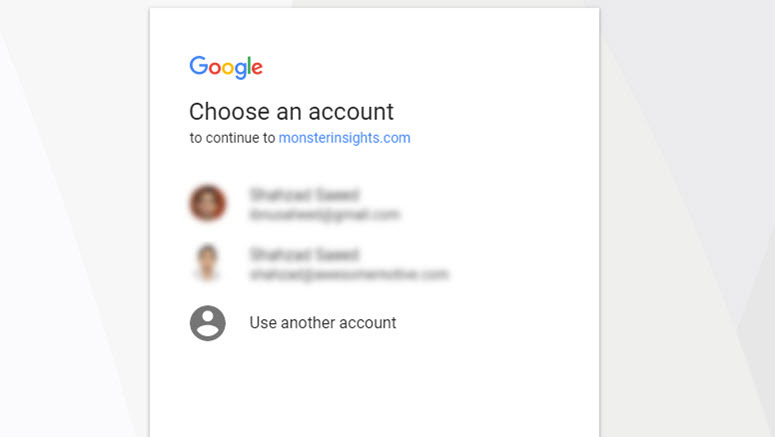 Next, allow MonsterInsights to manage your account. Finally, select the correct website profile for your blog and click Complete Authentication. 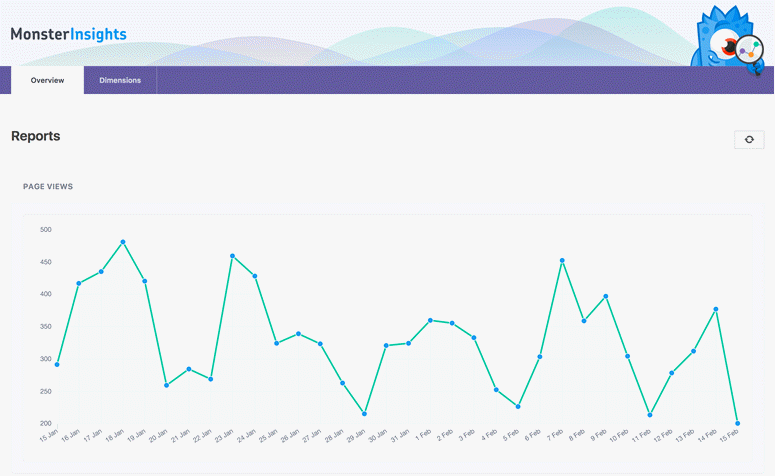 After authentication, you can easily find out how your website is doing by visiting Insights » Reports. 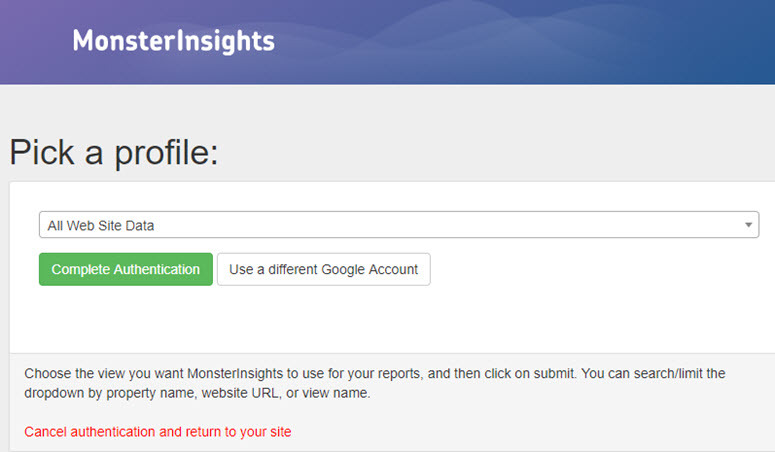 Get started with MonsterInsights today to easily set up Google Analytics on your site. Want to start with the free version instead? Try MonsterInsights Lite. Want to attract a targeted audience to your blog? The best way to attract targeted visitors is to drive more search engine traffic, also known as organic traffic, by improving your website’s SEO. According to OptinMonster, SEO is the practice of increasing your website traffic by getting your web pages to rank higher in search engine results. Visitors who arrive at your site via search engines are referred to as organic traffic. SEO can get technical and complicated but thanks to free SEO plugins and WordPress SEO guides, it has gotten quite easy, even for beginners. 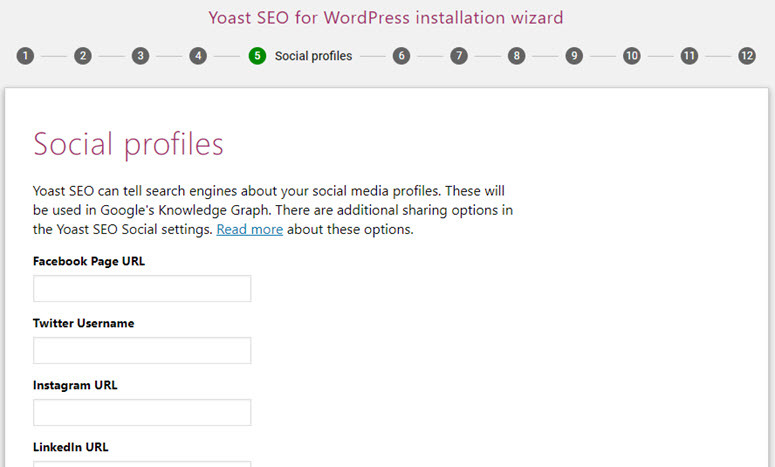 While you can find tons of different SEO plugins out there, we use and recommend Yoast SEO. It’s the most popular SEO plugin on the market. 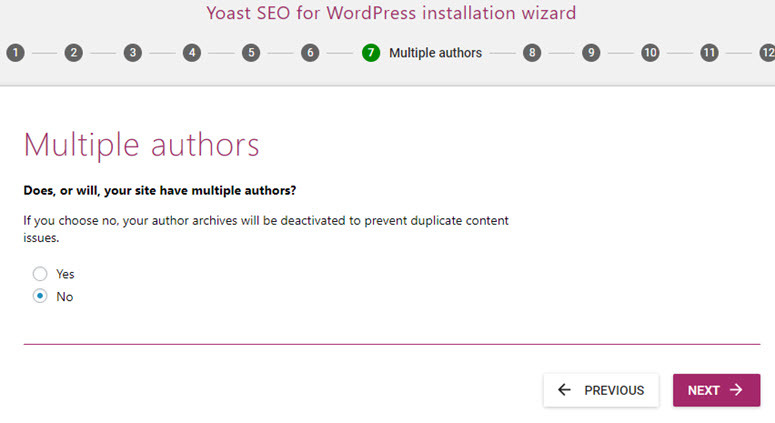 With Yoast SEO, you can easily add meta tags and titles to your WordPress blog posts / pages. It also forces you to choose a focus keyword for your blog posts and pages to make sure you’re using the keyword appropriately on that page. From your WordPress dashboard, go to Plugins » Add New. Search for Yoast in the search bar that you can find in the top right-hand corner. 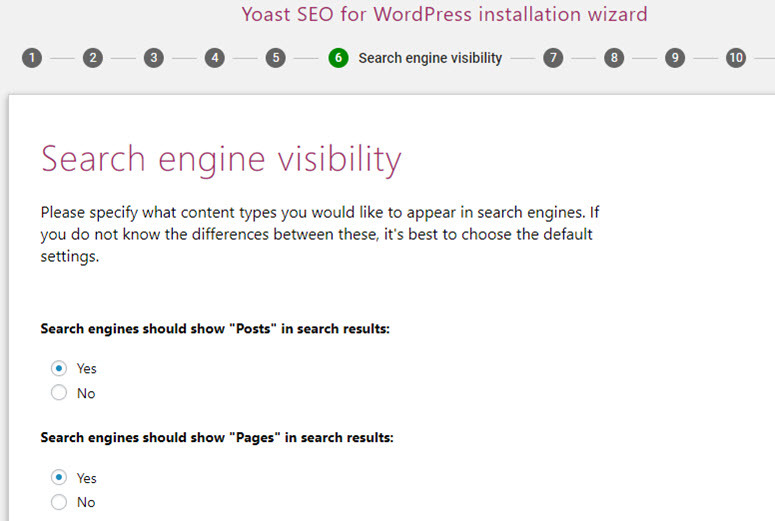 The Yoast SEO plugin will appear on your page. Click Install and then Activate. In your WordPress dashboard, you can now find the SEO menu in the left-hand taskbar. Simply click on it. If the plugin detects any SEO errors, you can fix them by following the suggestions provided. 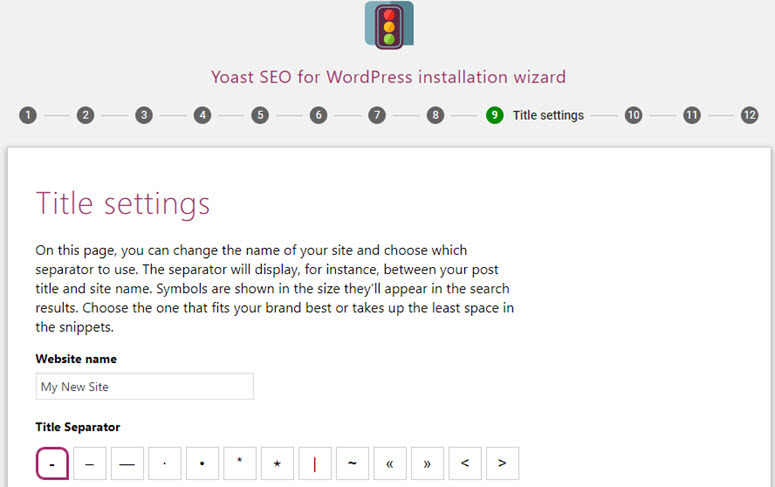 Setting up Yoast SEO is easy using the configuration wizard. Simply click on configuration wizard to get started. 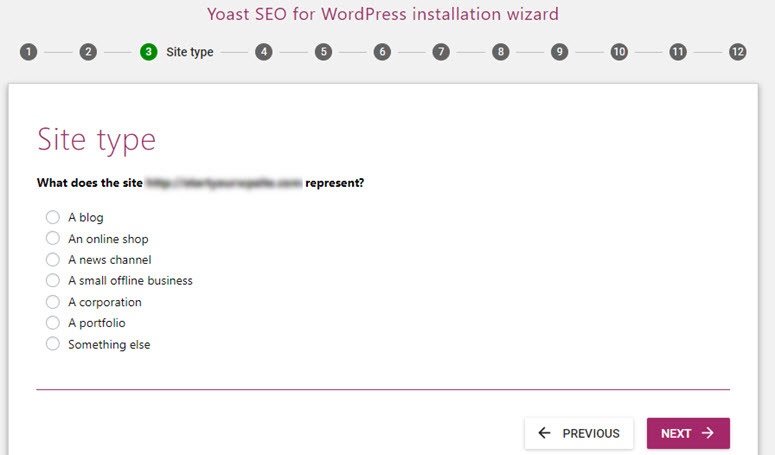 In the first step, you’ll be asked whether you want to configure Yoast SEO yourself or hire an expert to do it for you. 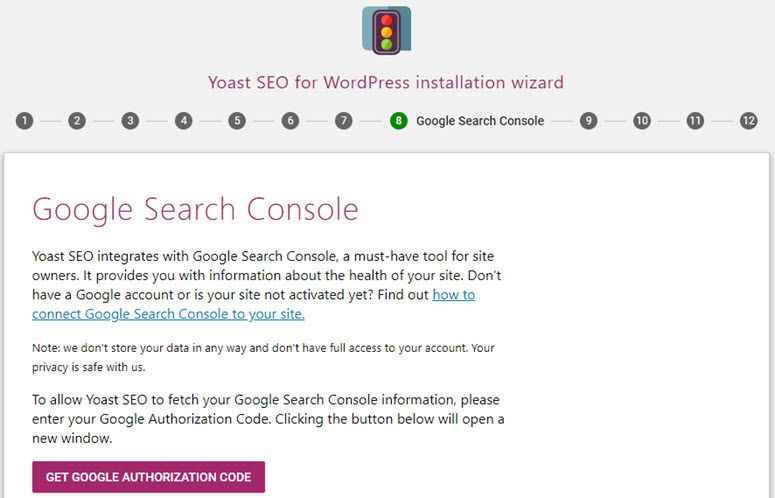 Select CONFIGURE YOAST SEO to do it yourself. In the next step, you’ll be asked whether your site is ready to be indexed. You can choose option A. Then, click Next. You need to choose the website type in the next step. For you, it’s blog. Then, click Next. For Google’s knowledge graph card, you’ll be asked whether the blog is run by a person or a brand. If Person is selected, you’ll have to specify the name of the person. If Company is selected, you’ll have to add the logo as well. Then, click Next. You can now enter your social media profile URL in its appropriate field. Then, click Next. In the Search engine visibility step, you don’t have to change the default settings because they’re set up to index your posts and pages. Simply click Next. Author archives might create duplicate content issues for search engines. To prevent it, you can disable it if your blog doesn’t have multiple authors. Next, you’ll be prompted to connect your website to Google Search Console, which is a free tool that gives you detailed insights into how your blog content is being perceived by Google. Next, you can set up a title for your blog, and then, click Next. 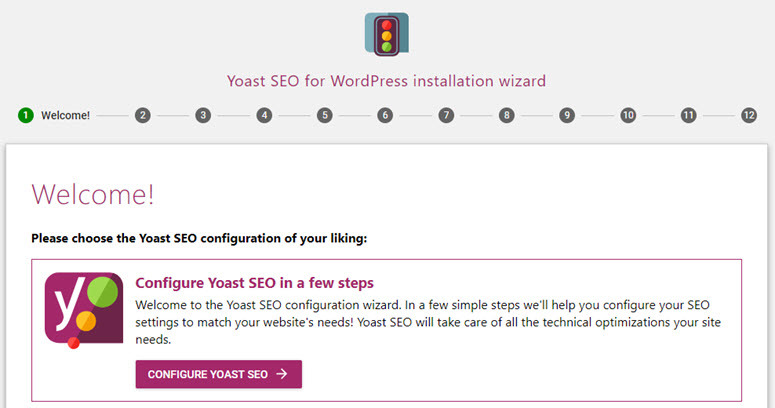 You can now exit the configuration wizard because the other steps were created for promotional purposes such as signing up for the Yoast’s newsletter. Get started with Yoast SEO today to improve your blog’s SEO. WordPress boasts about being the best publishing platform in existence, in terms of popularity and flexibility. Of course, with a whopping 60% market share, WordPress beats the pants off all their competition. However, the main downside is that the post and page editors aren’t as sleek as other blogging platforms. 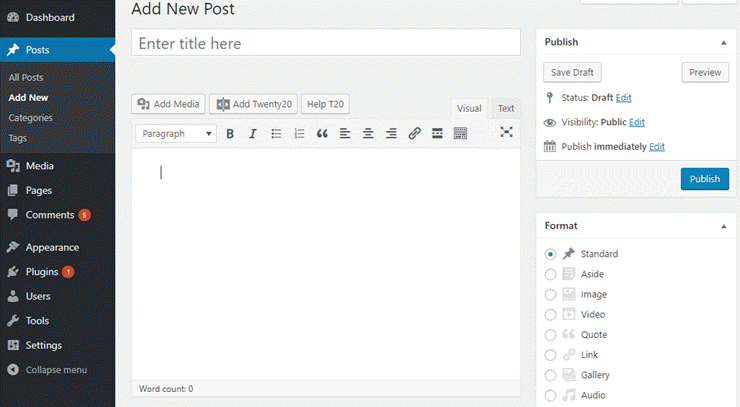 The default WordPress editor, which now known as Classic Editor, has a word processor style interface. It allows users to input text in either Text or Visual modes. Since it had been a part of WordPress for over a decade, existing users are accustomed to this interface. However, editors of other publishing platforms, such as Medium or Ghost are way more intuitive than that of WordPress. To make adding rich content to WordPress easier and enjoyable, with the 5.0 release, WordPress will be shipped with a brand new editor, known as Gutenberg. In this chapter, let’s take a look at the differences between Gutenberg and Classic Editor. By default, WordPress is shipped with Classic Editor, which allows users to input text in either Text or Visual modes. With Classic Editor, users can’t preview the finished page instantly while writing the content. Editing and moving different elements can also be a hassle. Users will have to switch back and forth between Text and Visual modes. They can also create spacing and sizing problems. This is where the Gutenberg editor comes in. The Gutenberg editor lets you see how a finished page looks like while in the editor. That way you can adjust sizing and spacing in real time without having to switch to the preview panel. The entire editing experience has been rebuilt for media-rich content. Gutenberg separates all the elements on your content into individual units called blocks. Unlike the Classic Editor, Blocks in Gutenberg help you easily customize the style and appearance of your multimedia content without the need of using custom code. Without a doubt, Gutenberg’s built for providing unmatched writing and editing experience on WordPress. Its goal is to make adding rich content to WordPress simpler and enjoyable. However, it doesn’t mean to replace the page builder plugins for WordPress. The built-in WordPress editors come with all the essential tools out of the box to create a basic page on your site. However, if you want to build an eye-catching page, then you might want to use a page builder on your site. Not only does it help you create a custom layout for your web page, but you can also create a stunning page without changing your existing WordPress themes. We recommend using Beaver Builder for building a custom page. You can also check out the best page builders for WordPress. We hope now you have a basic idea about WordPress editors. In the next 2 chapters, we’ll explain how to create WordPress pages and posts. In WordPress, you can publish content either as a post or page. When you want to publish a regular blog article, you write a post and when you want to publish a standalone web page, like About, Contact pages, you write a page. 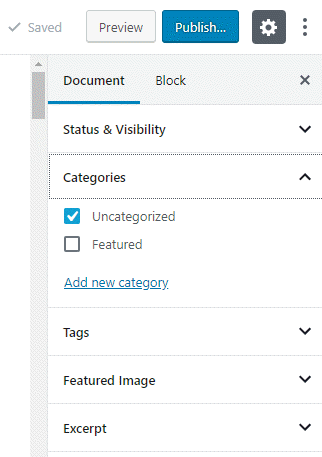 Another difference is that Posts allow you to organize the content using categories and tags, whereas pages allow you to apply custom templates and reorder them based on your needs. Your homepage is probably the first page your visitors see on your blog. To warmly welcome your first-time visitors, you might want to customize your homepage. Just take a look at an example of IsItWP’s homepage for inspiration. By default, WordPress sets your blog page as the homepage. However, you can create a page and choose it as your homepage. Before you dive in and create a homepage, below are a few things to consider. Built-in template: Check if your theme supports a homepage template. In that case, you can make use of it rather than creating a brand new homepage unless you want a different one. Full-width layout: If you want to set up a homepage on your own, you might want to choose a full-width / no-sidebar layout for the page. That way you can avoid sidebar elements from your homepage and easily create a highly customized page. Choose a page builder: You can find dozens of different page builders that help you create a stunning customized page on your own. Once you’ve a page set up for the homepage, you can go to Settings » Reading. Then select static page as your homepage and then choose your preferred homepage and posts page. Creating an about page is a great way to build an emotional connection with your audience. On your about page, you can explain how you started, why and what values your blog stands for. It’s essential for you to understand the motivations and fears of your audience before creating an about page. That way, you can create a compelling story of yourself that your audience can easily relate to. You’ll also need to figure out the right emotional ties to link your blog with your readers’ problems. 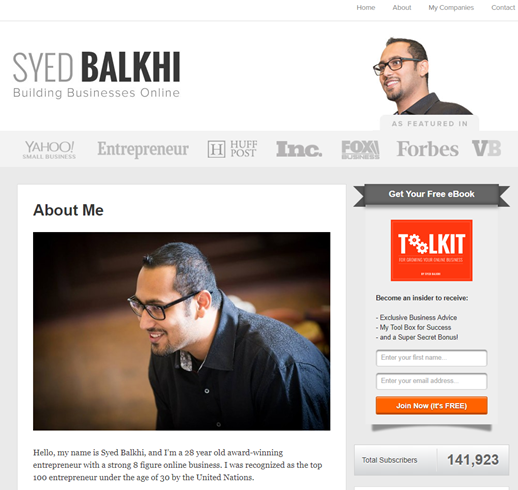 If you’re looking for inspiration, take a look at the about page of SyedBalkhi.com. In the about page, Syed reveals the struggles he encountered throughout his journey as an entrepreneur. Since the blog’s targeted at aspiring entrepreneurs and marketers, readers can easily forge a connection with their daily lives. Your contact page plays an important role in turning your website visitors into customers. If you want to encourage your audience to connect with you, then make sure to add a contact form to your contact page. Compared to displaying an email address, having a contact form in your contact page makes it easier for your audience to connect with you. That way, your audience can get in touch with you without leaving your site. 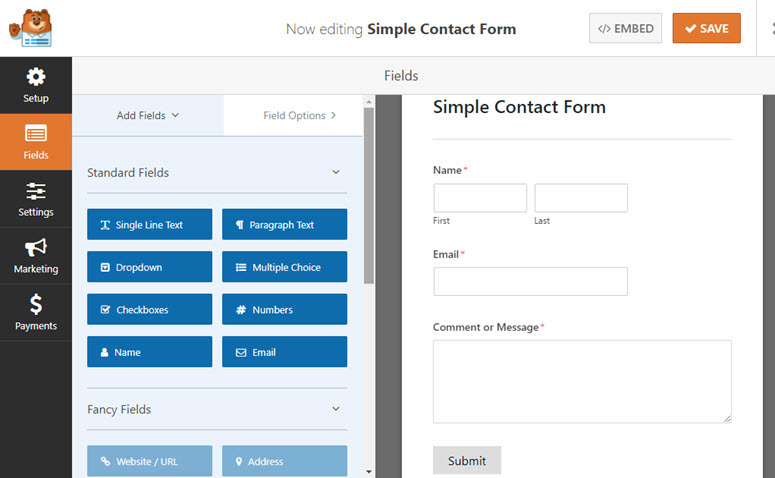 You can use WPForms to build a contact form on your site, which is one of the best form builder plugins for WordPress. To create a new page, head over to Pages » Add New. You can now specify title for your new page and add some content in the text area. 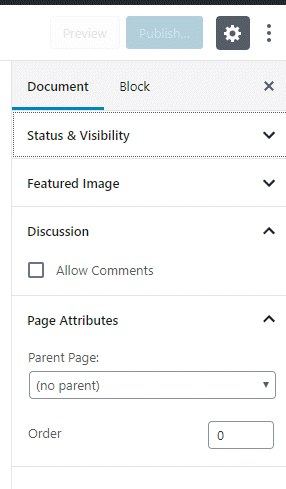 The Page Attributes section allows you to choose a parent page. You can also nest pages based on your needs. Some WordPress themes provide you with custom page templates. Choosing a template helps you easily add structural variations to your web pages. After adding content, preview your page and then click Publish. You’ve successfully published a new page. Now let’s take a look at how to create a page using Gutenberg editor. The first thing you’ll need to do is install and activate the Gutenberg plugin. This will replace the Classic Editor with Gutenberg. To create a page, head over to Pages » Add New. You’ll be prompted to add a title for the post. You can then start writing content, just like the Classic Editor. 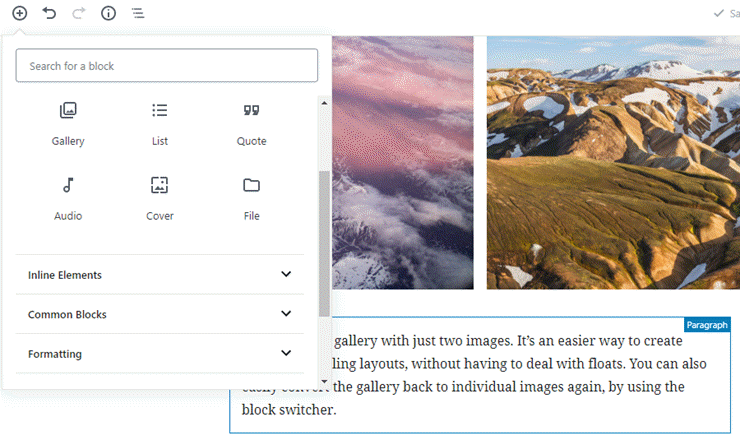 Gutenberg allows you to easily add any content block you’d like such as text, images, galleries, hero images, buttons, etc. To add a block, all you have to do is click on the Inserter tool (+). To find the Page Attributes section, click the gear button on the top right-hand corner and then, click on the Document tab. In Page Attributes, you can choose a parent page and nest pages based on your needs. In the Document tab, you can change your page template to add structural variation to your pages. To customize any Block, you can navigate to the Block tab and change the configurations of your selected Block. Now that you’ve created static WordPress pages and filled sidebar and footer with appropriate information, it’s time to start publishing your first blog post. By this point, you might have already figured out the purpose and niche of your blog. If you don’t, you can go back to Chapter 1 to learn it. 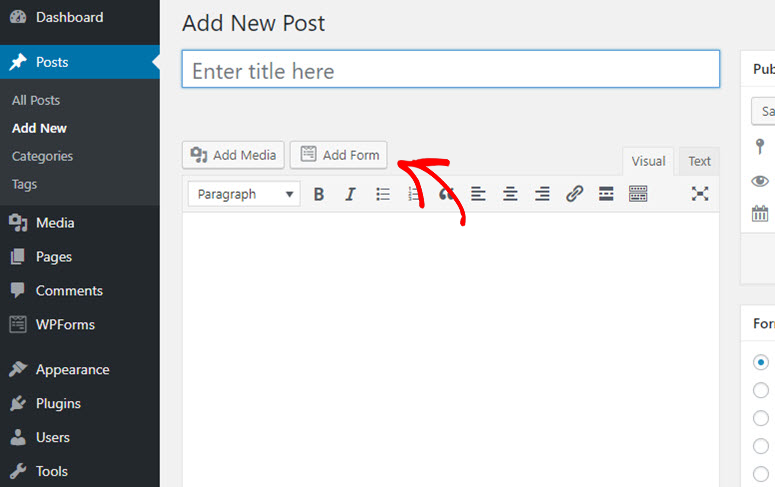 To create your first blog post, head over to your post editor by clicking Posts » Add New. You will need to add a title to your post and start writing content in your post editor. To upload images to your blog, all you have to do is drag and drop your images into the text editor from your computer. Alternatively, you can use the Add Media button to upload your images and videos. The first thing you’ll need to do is install and activate the Gutenberg plugin. To create a post, head over to Posts » Add New. You’ll be prompted to add a title for the post. You can then start writing content, just like the Classic Editor. The content of your WordPress blog is organized by categories and tags. Categories are basically a broad grouping of your blog posts. Think of it as general topics you cover or a table of contents for your blog. As they’re hierarchical, you can have as many as subcategories for each one. Tags are meant to describe specific details of your post. They can be used to micro-categorize your content and they’re not hierarchical. In your post editor screen, scroll down to the categories meta box on the right side. You can click Add New Category or simply choose from the existing categories. Similarly, using the Tags meta box, you can create new tags or choose from the existing tags. With Gutenberg, to add a category and add tags to your blog post, you can click on the gear icon on top right-hand corner of your editor. 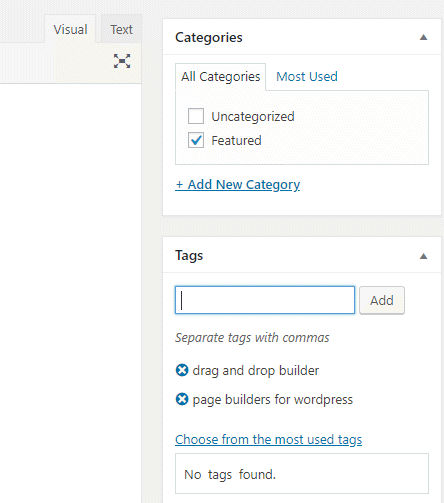 Within the Document tab, you can add categories and tags to your blog post. You can also change your featured image, excerpt, and even change the Status and Visibility options. You can click on the 3 dots for changing the view of your editor. You can also switch to code editor if you’d like. Finally, you can click the Publish button on the right-hand corner. A blog without readers and engagement is a dead blog. There’s no value in maintaining a blog if no one wants to consume your content. Just because you published some great content on your blog, doesn’t always mean that it could bring in loads of traffic. In fact, you’ll need to to attract the right segment of readers who will love the type of content you publish. Otherwise, they won’t stick around, which won’t be profitable for you in the long run. In this chapter, we’ll explain a few different ways to promote your blog. Before you dive in and start promoting your blog, it’s essential for you to publish some pillar content on your site. In fact, no one wants to stick to a site that doesn’t provide value. That means, if you’re driving traffic to a blog that doesn’t have a solid foundation, like pillar content, then you’re losing some of your most valuable assets: time, money, and other resources. Pillar content is the founding stone of your blog. Usually, it’s a series of blog posts that represent your best work, but it can also be infographics, videos, or any other type of content. The main benefit of pillar content is that it brings in a rush of new visitors and backlinks. Since it provides some sort of value, your audience is more likely to stick to your blog and promote it. Best of all, it continues to attract more traffic – long after they’re initially posted. Not sure what type of blog posts you should write? Don’t worry! We’ll explain a few different types of blog posts that are proven to work. Tutorials and how-to guides: Explain how to do a tedious task step-by-step, in an easy-to-follow style. This particular guide that you’re reading right now is a perfect example of a tutorial. Listicles: List posts are always among the most-shared content on the internet because they’re easy to digest. Latest industry news: Keep an eye on the latest industry news and blog about it. You can even explain what each trend means to an average reader, and how they can embrace the changes in your industry. Controversial subjects: Talking about controversy can bring some readers to your blog but be cautious! Controversies can be highly emotional. Be aware of the language you use, and try not to be purposely malicious when expressing your thoughts. Looking for more blog post ideas? Read 73 types of blog posts that are proven to work. Bear in mind that blogging is a constant process. Just because you’ve created a series of posts, doesn’t mean that you’ve done with content. Remember, blogging is a marathon, not a sprint. The success of your blog lies in how persistent you’re in terms of producing quality content. Now, you don’t have to produce one blog post every day. Have a publishing schedule and stick to it. Once you’ve laid a solid foundation for your blog by creating a series of pillar content, it’s time to step up and start promoting your blog. Email outreach helps you promote your blog in a few different ways: You can drive traffic and backlinks, get press mentions, offer guest posts on popular blogs, and more. Without a doubt, email outreach is the easiest way to develop a personal connection with influencers in your niche. Here’s how to do email outreach, the right way. Step 1: Understand your purpose. For example, you can start an outreach campaign to offer guest articles on popular blogs. Or if you want to build backlinks, you might want to pitch influencers and let them know you’ve produced valuable content on your blog that are worth linking to. Step 2: Find email addresses based on your purpose. If you’re looking to guest post, then create a list of email addresses of popular bloggers. Step 3: Use an email outreach tool, like OutreachPlus to create an outreach campaign. OutreachPlus helps you personalize your campaign, for higher deliverability, reply and engagement. It streamlines your outreach effort and helps you produce the best results. With the right strategies, email outreach can be very effective in building backlinks and driving traffic. Did you know that 95% of your first-time visitors will never return to your site? That means if you’re not building a connection with your first-time visitors and making them visit repeatedly, they’ll be gone forever. Creating an email newsletter is the best way to build connection with your audience and encourage them to return to your site. To create an email newsletter, you can choose an email marketing software like Constant Contact or MailChimp. You can occasionally send them useful emails to build a longlasting relationship. Once in a while, you can promote your recent blog posts in your newsletter and encourage your subscribers to visit your site. Social media is one of the most reliable traffic sources for your blog. If you’re struggling to crack the code on driving social traffic to your blog, below are a few tips that might help. Create a profile for your blog on various social networking sites. You can showcase those profiles on your blog and encourage your users to connect with you. Additionally, install a social sharing plugin like Shared Counts and make it easier for your users to share the content on social media. Focusing on every social network out there can spread yourself too thin. If you’re under a limited budget and resources, it’s in your best interest to focus only on one or two social platforms initially. If you’re looking for inspiration on driving social media traffic, you can check out how to increase Facebook traffic by 332%. If you’ve ever shared a blog post on social media, you might have noticed that the social network automatically pulls out the image, title and description of your content. This info gives a basic outline about the content you’re sharing, which entices other users to click on it. If you can’t find a beautiful preview of your post while sharing it on social media, chances are your theme doesn’t support OG (Open Graph) tags. OG tags help social networks pull the right info from your link. If you’re having the same issue for the links you share, then you might want to check out how to fix Facebook incorrect thumbnail issue. Below are a couple more ways to promote your blog. Blog commenting: Actively comment on popular blogs in your niche and get involved in the conversations. When users click on your name, they’ll be directed to your blog (provided that the blog you commented on allows backlinks from a commenter’s name). Search engine optimization (SEO): SEO enables you to grow your website traffic by getting your blog posts to rank higher in search engines. With onsite and offsite SEO tactics, you can drive more targeted organic traffic to your site. You can find more on this in the next chapter. Want to drive targeted traffic to your site from search engines? Search engine optimization (SEO) can be tricky due to the ever changing search algorithms. However, with the right strategy, you can grow your organic traffic despite the constant algorithm changes. By following the best SEO tactics, you’re allowing search engines to easily scan and index your website. Keyword research is one of the most important aspects of SEO. Keyword researching helps you understand what your audience is looking for on Google. Ideally, you’ll need to find every possible combination of keywords that your potential audience use on Google to find your content. Below are a few keyword research tools that you may find helpful. Google Keyword Planner: Keyword planner is a free tool that helps you find the right keywords for your AdWords campaigns. 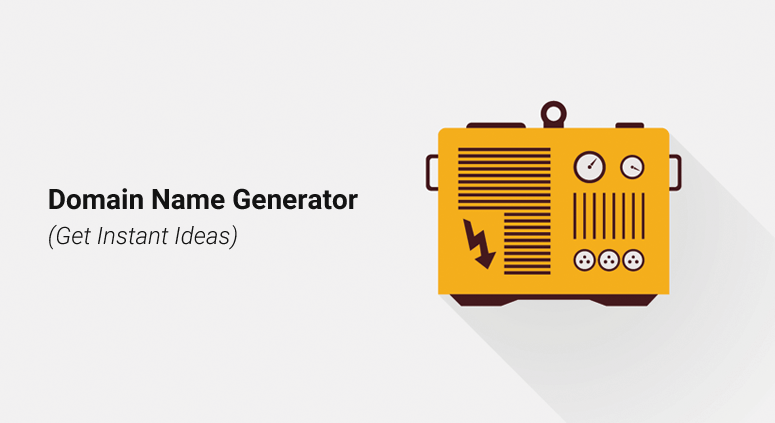 You can use the same tool for brainstorming your content ideas. Google Search: Google Search helps you find a lot of related keywords for your blog. You can find the related keywords at the bottom of your search results page. SEMRush: SEMRush is a paid tool that helps you find a list of potential keywords for your blog. It helps you find out what works for your competition, what site visitors in your industry are searching for, and what keywords you should focus on. Once you have a list of potential keywords, it’s time to create an editorial calendar to streamline your content creation process. In order to rank higher on Google and position your web pages on top of search results, you’ll need to optimize your web pages for search engine. With WordPress, it’s easy to optimize your website for search engines. Here’s how to do it. An SEO plugin helps you make your website search engine friendly. 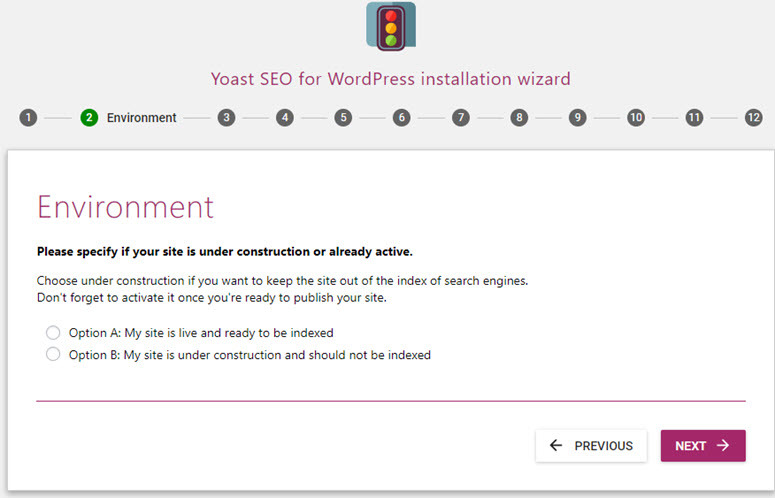 We recommend installing the Yoast plugin on your site. Upon installing the plugin, you’ll find a meta box on every post and page editor to add SEO title, description and focus keyword. 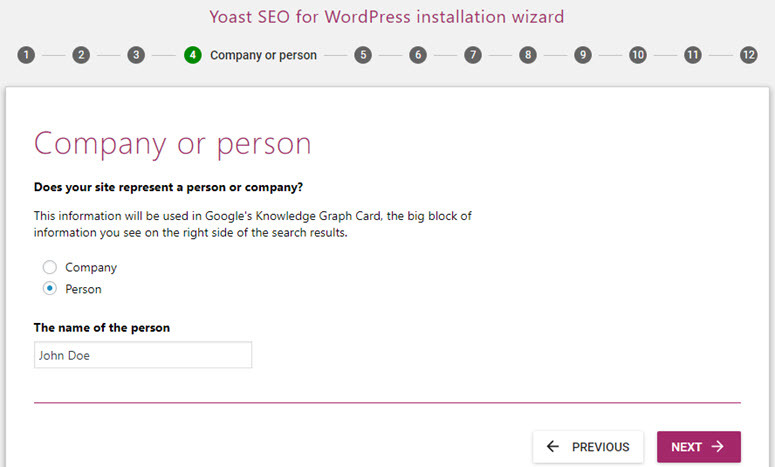 Yoast SEO forces you to choose a focus keyword when you’re publishing content, and then ensures you’re using it properly on that page. Alt tags help describes what’s on the image. Google places a relatively high value on alt text to identify what is on the image and the topic of the surrounding text. Add 2-3 internal links to every single post. Internal links allow users to navigate to other pages. It keeps your visitors longer on your site and more importantly, increases your link juice, which improves your SEO. Link building is a major factor in how Google ranks web pages. You can improve the ranking of your blog by increasing the number of high-quality links that link to your pages. There are lots of different ways to legitimately build backlinks to your site. Let’s take a look at a few of them below. We’ve mentioned it already but we’re saying it again. Before you dive in and trying to build backlinks, make sure you already have published a handful of content that is worth linking to. Some examples of pillar content are how-to guides, listicles, and case studies. You can either hire a graphic designer or create it by yourself using an infographics creator tool such as Canva, Piktochart or Visme. After creating it, make it shareable by providing an embed code that your users can easily use. Create a list of blogs that are likely to provide a link back to your blog. For instance, you can find blogs that publish weekly recap about your niche and ask them to feature your article in their upcoming post. Create a list of influencers and publish a one-question interview with them. Chances are they’ll likely add a link to the interview you’ve published. Publish high-quality guest articles on reputed sites in your niche. While it’s an effective strategy to gain links, keep in mind that Google has cracked down on marketers who abuse this tactic with low-quality articles and links. Do you want to quit your 9 to 5 job? Wondering how to start a blog and make money? Then you’re not alone! While blog monetization isn’t a quick rich scheme, with the right strategies, it’s totally possible to make a solid income. In this chapter, we’ll be explaining 4 different methods to make money blogging. Advertising is probably the easiest way to make money blogging. You can start by displaying ads by Google AdSense, which is an advertising network by Google. The best thing is that it doesn’t require you to have a huge traffic volume to join the program. Alternatively, you can sell direct ads on your site. It’s effective for your blog if it attracts a significant traffic base. Since it doesn’t depend on any ad networks, you can keep the full ad revenue profits. For monetizing your site with any kind of ads, we recommend using the AdSanity plugin. It simplifies ad management helps you generate more ad revenue with minimal effort. Affiliate marketing helps you generate revenue from your blog when someone purchases a product through your referrals. Basically, you choose a product you like, insert an affiliate link to that product and whenever someone purchases it by clicking your link, you can earn commissions. If you think ads are annoying, affiliate marketing is the best way to earn solid revenue from your blog. You can even use it in conjunction with advertising and other monetization methods. We use and recommend ThirstyAffiliates for managing and cloaking affiliate links. Offering your skills and expertise on your blog as a freelancer is the best way to make a living you’re your blog. Not only will you be able to showcase your portfolio on the blog, but also you can attract the right segment of paying clients. Make sure to create a hire me page on your blog and promote that page extensively. If you’re looking to make a steady flow of passive income, then you might want to consider selling products from your blog. With the right strategies, it’s totally possible to make a full-time income from your blog by selling products. Sell eBooks: Creating a product can be a tedious and intimidating task. If you already have published some great pillar content, you can easily repurpose them into an eBook and sell it to your audience. Integrate an eCommerce store: Integrate an eCommerce storefront into your existing blog with an eCommerce plugin such as WooCommerce. If you sell merchandize that mirrors the type of content they love on your blog, then you can piggyback your existing user base to sell your eCommerce products. The WordPress community is huge, so you can find tons of different resources on the web that will help you learn and master WordPress. IsItWP: At IsItWP, we regularly publish WordPress tutorials, WordPress theme and plugin roundups, reviews, WordPress deals, and a lot more. WPBeginner: WPBeginner is the largest free WordPress resource on the web for WordPress beginners. They regularly publish useful tutorials, videos, coupon codes for WordPress products, and a lot more. WPForms blog: If you want to read tutorials that help you grow your business using the WordPress platform, you need to follow the WPForms blog. 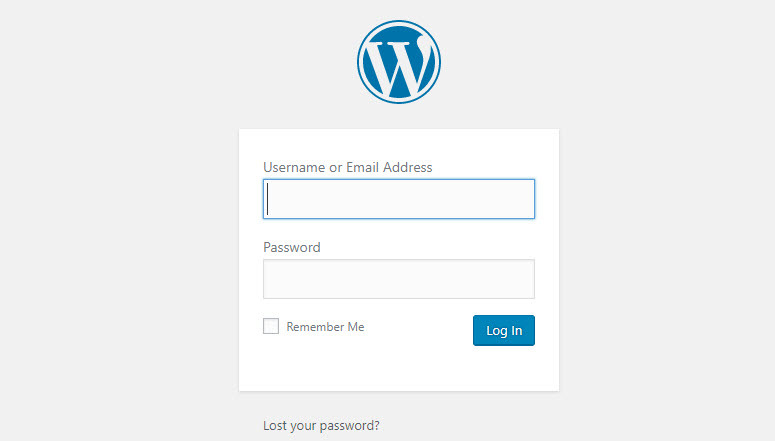 You can also find tips and recommended practices to build any types of online WordPress forms. 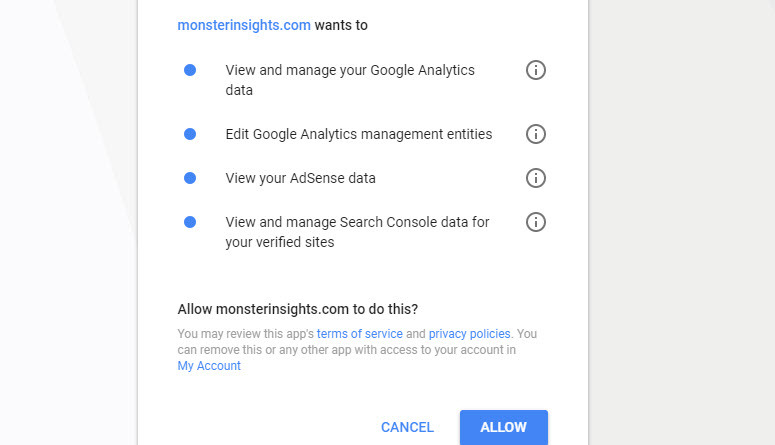 MonsterInsights blog: The MonsterInsights blog is an excellent resource you can follow to get a handle on Google Analytics best practices and recommendations. Having helped thousands of users start a blog, we’ve found that people ask the same sort of questions again and again. This is why we’ve compiled a list of frequently asked questions, so you can easily start your blog. A blog is just a type of website that publishes articles in reverse chronological order. Blog articles are usually published using a blogging platform like WordPress, so anyone who can’t code can start a blog with ease. Once the blog is set up, you can easily start creating content in your post editor and publish it with the click of a button. Can I create a blog without WordPress? Yes! There are dozens of blogging platforms such as Blogger, WordPress.com, and TypePad. But we always recommend you to start a blog on self-hosted WordPress because it gives you full freedom to build a blog the way you want with no restrictions. What’s the difference between WordPress.com and WordPress.org (self-hosted WordPress)? WordPress.com is a free blogging platform that lets you kickstart a blog with ease, but it comes with a lot of restrictions such as limited theme availability and limited storage space. Plus, the free platform doesn’t allow you to monetize your website. WordPress.org, also known as self-hosted WordPress, requires you to own a domain name and a hosting account to run a blog. With a self-hosted platform, you get full control over your blog, can monetize your blog the way you want, get unlimited theme and customization options, and enjoy unlimited storage space depending on your hosting provider. To start a blog on self-hosted WordPress, you’ll have to purchase a domain name for $14.99 per year and a hosting account, which costs around $7.99 per month. Altogether, starting a blog will cost as low as $110.87 annually. You can find thousands of free themes and plugins for your blog. However, if you prefer premium themes and plugins, the running cost of your blog may go higher. Can I start a blog anonymously? If you want to publish a blog but remain anonymous, then you need to make sure to protect your domain with WHOIS privacy turned on. For anonymous blogs, people often use a pseudonym/nickname to write under. You can even create a unique email just for writing your blog. What should I start a blog about? While you can start a blog on any topic, it’s advised to start a blog on a topic that you’re really passionate about. Or you can even start a personal blog, documenting your data-to-day life and reach out to like-minded people on the web. Can I run a multi-author blog? Yes. WordPress comes with 5 default user roles that will help you manage and control permissions for each author on your blog. Can I add an eCommerce storefront to my blog? Yes! Adding an eCommerce storefront allows you to easily start selling physical or digital products right from your blog. Just install a plugin like WooCommerce and integrate an eCommerce storefront into your blog so you can start selling your products. How can I learn more about WordPress terminologies? Refer to this WordPress Glossary Terms for Beginners whenever you’re puzzled by strange WordPress terms or abbreviations. Can I start a blog in multiple languages? With WordPress, you can easily start a multilingual blog with a multilingual plugin such as Polylang. You might also want to choose a WordPress theme that supports the multilingual plugin you want to use. We hope this guide helped you start a WordPress blog. Have fun blogging! I have started all over again… years of “hard work” become trash. The worst thing is I knew it was about to happen sooner or later. The only good thing I can get from all this disaster is knowledge and experience. Thanks to your help and support I can re-construct my blog. But doing it right this time. Yup, you can use your parent’s card if you’d like. Interesting information. Thanks for sharing with us. According to your webhost link I tried to create account for writing a blog. At payment method it is asking for credit card number,but I don’t have a credit card.so I selected “pay pal” it is asking for pan details can I give.or their any other payments method. Hi ! Thats great article. Hi Shahzad, You did a great job indeed. Just came across your blog online and can’t stop myself from commenting. In your article, you have mentioned few essential plugins list for WordPress blog. Can I ask you to add one more in this list. Because I think any blogger or website owner will get their work done easily in designing their blog page with “Blog Designer” plugin. Zero coding skills required to use this plugin. Hope users like this plugin. There are a few great sites that tell you how to start a blog but this is by far the most simple step by step instruction thanks for sharing. Glad you find it useful, Freddie! David – udemy courses are sometimes fantastic ! As you say they cary from that to, well, sub-par. I always look at the free portions etc in order to make an informed decision as to whether its likely to be a good course. Also as you say this is a great article from Shahzad. When it comes to computer stuff I always google and check blogs etc for info before looking at udemy. I think udemy’s strength is in courses for creative matters – eg creative writing an so on. Personally, I’d also google before looking at Udemy or any other premium course websites. Wow, I have purchased many blogging courses on Udemy it was a waste of my time and money not to down sell Udemy as a site. I love some of their courses. But your How to Start a Blog was great it answer a lot of my questions on how to start a blog step by step thank you much.